Compliance with the OSHA requirement for Grade "D" Breathable Air can be accomplished with the use of a Quality Air Breathing System -Model 50 SL, manufactured by Martech Services Company. According to Tom Wright, Director of Sales and Marketing, when used properly, a Model 50 Single Line Hose System will work with the existing compressed air supply. The Model 50 SL System will provide Grade "D" Breathable Air for a NIOSH approved respirator, and with the provided 54" tool air hose, it will supply air for a spray gun, all via the included single line hose assembly. 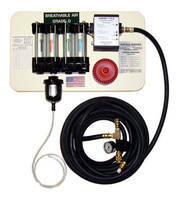 Model 50 SL systems are available with 35' 50' single line hose assembly. A Model 50 SL will work with the existing compressed air supply. The four stage filtration, filters the air, and the on board carbon monoxide monitor continuously monitors the air quality for compliance with current OSHA standards. "Quality Air Breathing Systems are by design, the affordable solution to providing the breathable air required to protect painters, blasters, and welders" Wright said. "Complete systems designed to fit the users facilities and needs, to include hoods, masks, and hoses are also available." Major corporations look to Martech Services Company for their air supplied system needs. National dealer equipment programs and major paint manufacturers, alike, have chosen Martech as their preferred source. Additionally, each system is backed by a one year warranty and supported by a toll free sales and service, telephone support staff, around the clock, 7 days a week.